Canadeo’s football career started at Gonzaga University in Spokane, Washington. He was known as “Gray Ghost of Gonzaga” due to his prematurely graying hair. Unfortunately the university dropped the football program in 1941, making Canadeo the last “Zag” to play pro football. During his senior year he boxed for the Bulldogs and was named team captain. The Green Bay Packers drafted Canadeo in the ninth round of the 1941 NFL Draft. He played for the Packers until 1944, when he was called to serve in World War II in the U.S. Navy and U.S. Army. 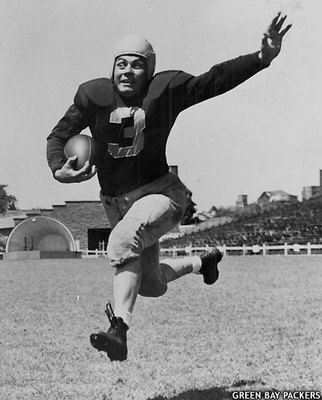 He returned to the game in 1946, becoming Green Bay’s primary ball carrier. As a running back, he was the first Packer, and the third player ever in the in the NFL, to rush for 1,000 yards in a season. He gained a total of 1,052 yards in 1949. In addition to this, he recorded nine career interceptions on defense and served as the team’s punter. His number (3) was retired in 1952, being one of the only three numbers in Green Bay Packers history to be retired. When Canadeo’s playing career was over, he continued his service to the Packers as a broadcaster and member of the organizations executive committee and remains listed as one of the directors emeritus. In 1959 Canadeo played a small part in helping Jack Vainisi reassure Vince Lombardi that the move to Green Bay from New York City, where he was assistant coach for the New Your Giants where he would be comfortable for his family, attributing to the success of the team in the “Lombardi era”. Canadeo was inducted into the Pro Football Hall of Fame in 1974. In the summer of 1972 he underwent a kidney transplant, having received a kidney from his own son Robert. Canadeo passed away on November 29, 2003 in Green Bay at the age of 84. Tony Canadeo will be inducted into the Steinmetz Alumni Hall of Fame on June 8, 2014. 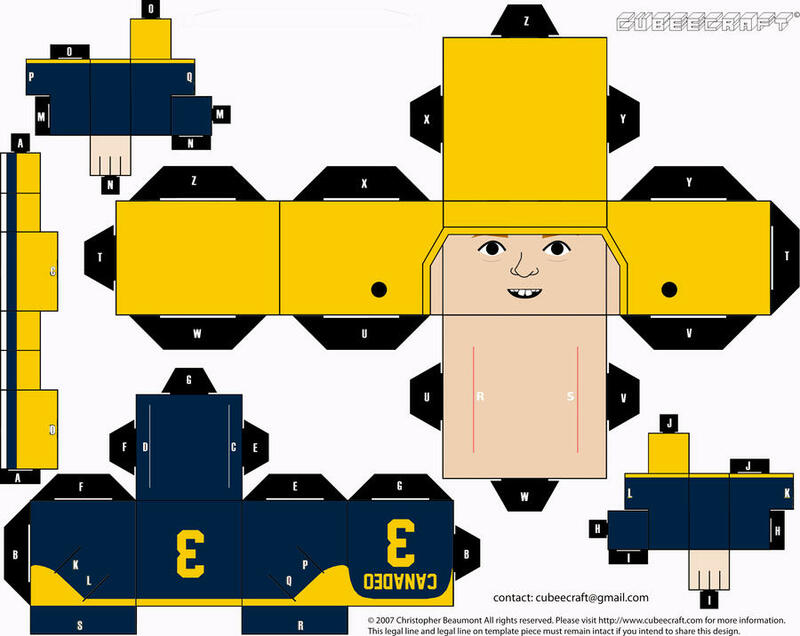 For fun, you can download a paper craft of Tony Canadeo here! “Don Hutson, Canadeo on pro all-star squad”. Milwaukee Journal. December 16, 1943. p. 8, part 2. “Tony Canadeo takes his army oath here”. Milwaukee Journal. December 31, 1943. p. 2, part 2. Silverstein, Tom (November 30, 2003). “Running back stuck with Pack”. Milwaukee Journal Sentinel. p. 1A. “Canadeo shows boxing promise”. Spokane Daily Chronicle. February 14, 1941. p. 12. Grody, Ray (February 5, 1946). “4 Packers may bolt to All-America”. Milwaukee Sentinel. p. 3, part 2. “Gonzaga opens boxing season December 12”. Spokane Daily Chronicle. December 5, 1941. p. 11. “Tony Canadeo joins Packers”. Milwaukee Journal. August 22, 1943. p. 5, part 2. 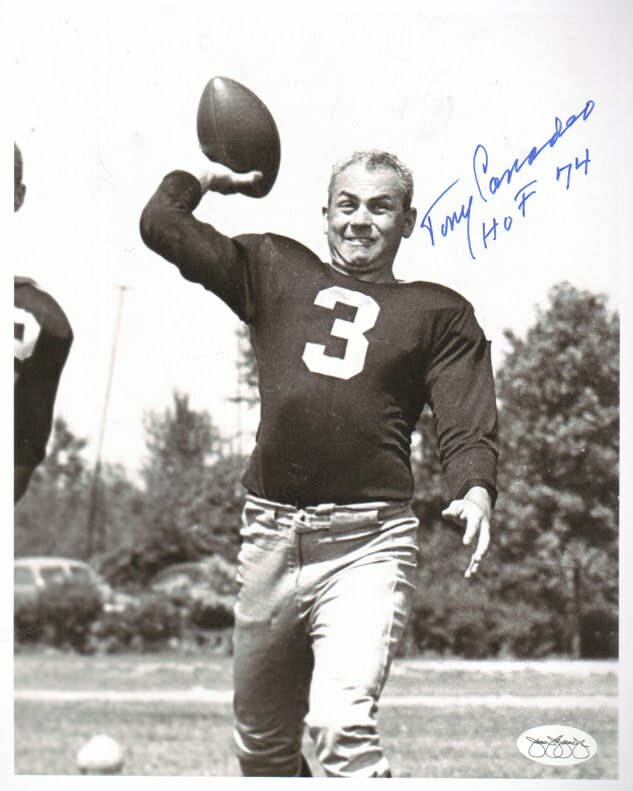 “Pro Football Hall of Famer Tony Canadeo dead at 84”. Sports Illustrated.com. Associated Press. November 30, 2003. Retrieved February 5, 2014. Blanchette, John (December 5, 2003). “Canadeo, Deeter leave void in history”. Spokesman-Review. p. C1. “Canadeo good after transplant”. Milwaukee Journal. August 2, 1972. p. 17, part 2. Christl, Cliff (December 4, 2003). “Canadeo is remembered as a star on, off field”. Milwaukee Journal Sentinel. p. 6C. If you have any information on any outstanding Steinmetz alumni that we should spotlight(even if it’s yourself), please feel free to contact us with info! Use the “Alumni Spotlight” selection in the drop down menu.